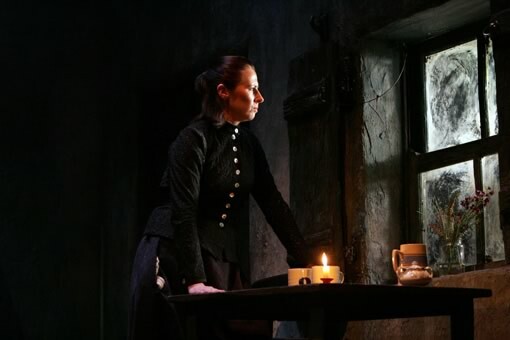 A one-act play, written in the summer of 1902, The Shadow of the Glen was the first of Synge’s plays to be staged in 1903. Nora Burke is married to Dan, a sheep farmer many years her elder, and they live in ‘the last cottage at the head of a long glen in County Wicklow’. Dan shams death, but not before he put Nora under ‘a black curse’ not to touch his body and insist only his sister should lay him out. Nora observes all the rites of a wake with a passing Tramp who begs shelter from the wet night. Nora begs to be excused and leaves the Tramp alone in order to call to a young neighbouring sheep farmer, Michael Dara. Once she is gone, Dan Burke sits up. He shares his suspicions and his schemes with the Tramp and assumes his sham death-pose before Nora and Michael enter. Michael is hatching plans for Dan’s legacy and Nora’s thoughts are taking on an unexpected dark complexion, when Dan announces himself with a sneeze. Dan banishes his wife from the house and the Tramp takes up her cause, soothing her with fine words to win her over to a life on the road. They leave together, the pair behind complimenting each other over whiskey. First performed at the Molesworth Hall, Dublin, on the 8th October, 1903, it was condemned as ‘a slur on Irish womanhood’ by prominent nationalist, Arthur Griffith. It was first published with Riders to the Sea by Elkin Mathews, London, in 1905.